Ever since I first got my digital camera last summer, I have been intrigued by taking pictures of my feet. At least while I am outside. It started off as just playing around. One of the first days I had the camera I was playing with the sport setting and decided to snap a picture with the camera facing the ground every so often as I was walking to school. Looking over the pictures when I go home, I was amazed at the variety of surfaces I had walked over. Some I had never noticed before. 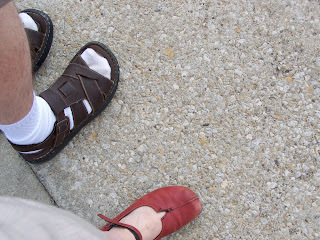 Since that time, I have taken pictures of my feet while walking off and on. Last week, my husband and I were walking home from the Library. I decided to get a four-foot action shoot while we were walking. However, my favorite is the one below, which I took at a busy intersection waiting for the light to change.